Being one of the most popular holiday resort in Turkish, Icmeler is the perfect combination of beautiful beaches, quality services, and attractions for all kinds of holidaymakers. Find out why this small town is so popular and has thousands of tourists coming back every month. Learn about the hottest places to visit, what to do and where to stay in Icmeler. This lovely small town is located in Turkey and it is 8 kilometers ( 5 miles) from Marmaris. The town is surrounded by pine forests and is perfect for holidays. The peninsular of Icmeler is also the point where the Mediterranean sea meets the Aegean sea. Very interesting, huh? If you’re into history, then head out to the Marmaris Castle, only a short distance away from Icmeler, there you’ll get the chance to get to know more about the history of the area. You won’t regret it! If you are a walking enthusiast, you will love the trails and walks from Icmeler to Degirmenyani that is about 19 kilometers (12 miles) with places for picnics along the way. How great is that? For those who want to sail, a good place to go is the village of Turunc, a beautiful place for you and your family. 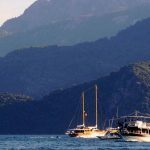 An incredible event that is worth attending is the International Marmaris Yacht Festival that happens in May and has yachts and motorboats racing between the Icmeler bay. If you have kids a great place to go is the Iztuzu beach that has turtles in the summer and a beautiful golden sand. There are a lot of fun things to do in Icmeler beaches. You can go scuba diving, or take some diving classes with the instructors. The sea is calm, making it the perfect place to take your kids to while offering many watersports. How about going on banana boats, parasailing or power boats? All of these are available at Icmeler beach. Icmeler beach is a great beach to enjoy high-quality services and great water. Here the sun is present all year long, giving it a paradise look. The temperature starts to heat up in April with temperatures above 20C ( 68C ) reaching its peak in July and August, with temperatures that are above 30C ( 86F ). At the end of October, it starts to wind down. Icmeler has hotels to all kinds of holidaymakers, from clean, more standard hotels with bed and breakfast, to low-cost apartments. There are also luxury hotels with swiming pools and fancy things. It is up to you to choose from the many options the best for you and your needs! Besides the many watersports on the beach, you also have the option to attend many bars and nightclubs to keep you entertained. If you love shopping you can visit the Icmeler market, with many cheap handbags and many different kinds of homemade crafts. Enjoy live music in restaurants and pubs that are usually opened until about midnight. For endless walking opportunities, you have the peaks around Icmeler, great for hikers and for an array of shops and galleries of art, you can go to the Greek islands of Rhodes from Marmaris. – The town has had a great rapid growth over the past 15 years and is a good choice for those who want a quiet place near the populated Marmaris. – The port of Marmaris is right across the bay of Icmeler and receives many tourists every single month. – If during your stay in the resort you have a birthday, you can talk to the owner of the bar and he will happily order you a cake and put up balloons. Cool, right? – If you make some local friends they will probably greet you with a handshake and one kiss on each cheek. Icmeler is the perfect place to go on holiday at any time of the year. The amusing beaches, nice people, restaurants, and bars, make it a great choice for you, whether you’re single or want to spend quality time with your family.